Minutes, scattered correspondence and financial information, administration files, scrapbooks, and printed materials of the voluntary organization which sponsored the Winter Carnival since 1885. The administration files contain financial and membership information, event files (documenting both indoor and outdoor activities), publicity and promotional material, festival schedules, and a variety of printed materials. Photographs, legends, and background information concerning the history of the carnival and its royal court are also included. The Saint Paul Winter Carnival is one of the oldest civic celebrations in the country. Beginning in 1886, the carnival was, in part, a response to those who called Minnesota as uninhabitable as Siberia. The parades, outdoor activities, and ice sculptures were also a celebration of the city’s success. Over the years, the Winter Carnival took on a life of its own: local businesses participated in the parade, athletes in the sporting events, and locals in the King Boreas and Snow Queen competition. 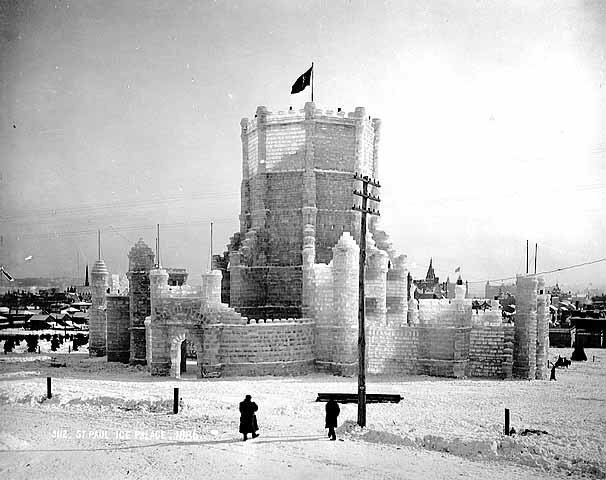 Although the Carnivals’ ice castles are iconic symbols of the celebrations, St. Paul was not the first to build ice castles. Empress Anna Ivonovna of Russia built the first in 1739. Montreal took up the tradition in 1883, but their winter carnival disbanded in 1885. St. Paul decided to invite the Montreal ice castle architect to Minnesota to build the first St. Paul ice palace in 1886. In the 1930s and 1940s, St. Paul asked African American architect Clarence Wigington to design the ice palaces, and these were among the most popular of all time. The grandest ice palace was built in 1992 to coincide with Minnesota hosting the Super Bowl. The castle was 200 feet wide and used 15 million pounds of ice. The most recent ice palace was built for the 2004 Carnival. Carnivals were held in 1886-1888, 1896, 1916-1917, 1937-1942, and every year since 1946. Although incredibly popular, the Carnival’s sporadic run in the early years was due primarily to finances and in recent years there has been renewed debate about the costs of the annual festival.